The Poker Diva cherishes the diamond placed in the middle of the spinner. The diamond holds the secret to the Diva's winning streak. The Diva is 45 mm in diameter and has a gold-colored diamond cut edge. 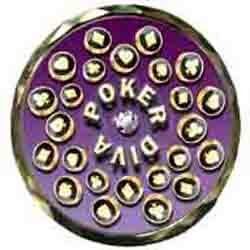 The Poker Diva poker spinner and card protector includes an acrylic case for safe keeping. Weight: 2.8 ounces.